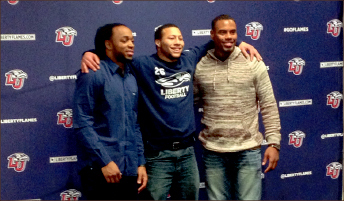 Former Liberty Flames football players Rashad Jennings and Mike Brown returned to Lynchburg to promote Habitat for Humanity and R&M Endeavors Friday, Feb. 21. R&M Endeavors was formed by Jennings and Brown and is designed to serve Lynchburg and Charlottesville, Va., through community projects and football camps. After spending his first five seasons in Jacksonville, Jennings made the transition across the country to California. In his sixth season, he displayed his potential as a quality running back in the NFL. He led the Raiders with 163 carries for 733 yards and six touchdowns, appearing in 15 games. Brown, who spent the majority of his time at quarterback and little time at wide reciever at Liberty, has transitioned back to receiver and ascended to the top of the depth chart with the Jaguars. Despite being NFL players, Brown and Jennings have not lost sight of how they achieved that goal, and coming back to Liberty is one of the ways they want to give back to the community. Brown explained how the two based R&M Endeavors on serving the greater Lynchburg region. Jennings emphasized their campaign’s goal to guide and influence teenagers. They hosted a Kids’ Punt, Pass and Pancake Breakfast and a Skills and Drills minicamp at Williams Stadium for third to eighth grade students Saturday, Feb. 22. “Even if (the kids) don’t learn anything through any drill we do, if we can say something to them that will impact them, that’s what we want to do, just plant a seed, a small seed,” Brown said. Jennings and Brown appeared at Convocation Friday, Feb. 21 and later that evening at a player panel to explain to the only goal of their initiative ­— positively affecting people’s lives, even if just one person.